For those of you local to Reading, PA, you may remember last year’s Speakeasy show from Reading Theater Project. It got rave reviews and was generally considered genius on toast by all who experienced it. Well maybe that’s a bit of an exaggeration, but it was very well received. It was a ton of fun to write and watch. I still warm up the uke for a round of “He’s My Father” once in a while. This year RTP is back at it with a slightly different show. 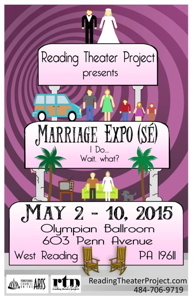 For one thing, Marriage Expo(sé) has about twice as many cast members. It’s twice as chaotic. There are so many characters the writers (Vicki Graff and me) are forced to actually (ugh!) act in it. Performance is a seductive thing for me. An addiction. I can never get enough once I start on a bender. I’ve quit cold turkey twice now and had hoped it would stick. At this point, I’ve been sober for a few years. I just don’t need something to come along and give me a platform and a microphone. I’ll be right back haunting soap boxes in back alleys and theaters in the dicey parts of town. One day soon I’ll be waking up in the gutter outside a club that hosts open mike nights. But Marriage Expo(sé) will be worth it. I promise. It’s a parody of convention center shows. You know, like the boat shows, British invasion car shows, wedding expos, etc. It’ll be a combination of vendor booths and traditional stage show held on the runway. The audience members get to choose how much interaction they’ll participate in: none or a lot. They can watch the show from seats or mill around by the booths, or do a little of both. Like last year’s Speakeasy, it will be held at the Olympian (Fred Astaire) Ballroom on Penn Avenue in West Reading. There are some hilarious vignettes like the Fathers-in-Law support group. Or the Family Loan Center where you can borrow a fully functioning family if yours is not spiffy enough for a visiting boss. But there are also some dark moments such as when the announcer has a crisis in his relationship with the Expo itself. It’s complicated. It’s like a Robert Altman movie where there are several small plots going on at once and the protagonist is more an object or idea than a person. That is similar to Speakeasy where the main character was the city of Reading in the 1920s. Sure there were characters and they had their arcs, but they were dressing for the larger tragedy of our town. Here too, there are several plot lines but the main character is marriage itself. So what would be an arc for a marriage? Readers Digest has aptly answered that question and we mined that text to illustrate it in Marriage Expo(sé). You can probably get the picture from that. See you in the aisle. This entry was posted in Uncategorized and tagged Marriage, parody, satire, theater. Bookmark the permalink.